The Football Front: Stage One of Liverpool’s rebuilding process or just a minor triumph? Stage One of Liverpool’s rebuilding process or just a minor triumph? Jordon Florit tells the Football Front why Liverpool's League Cup success could be a sign of further success. Fittingly, after six years without a trophy, it was nearly Dirk Kuyt, who joined six years ago, that won the Carling Cup for Liverpool: firstly, with his 108th-minute goal that fired Liverpool into an extra-time lead and then with his goal line clearance before Cardiff’s eventual equaliser. Unfortunately, Dirk Kuyt wasn’t the hero, which would’ve been an apt reward for the tireless Dutchman, but Liverpool did get the victory. 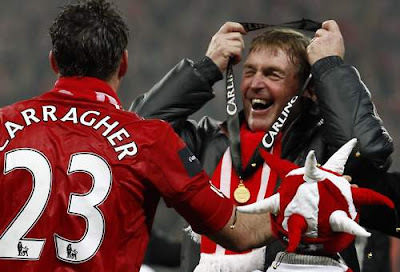 It came little over 18-months since Kenny Dalglish’s homecoming at Liverpool, 20 years after leaving the Anfield club, and his return of a trophy in his first full season in charge befits his title as King on Merseyside. Seemingly his presence in the dugout once more has guided Liverpool off the rocky road on which they were driving down and things have been running much smoother. However, his second reign hasn’t been without its own potholes. Since their last trophy, the FA Cup in 2006 – or the Community Shield if you prefer, Liverpool have seen their number of top flight victories trumped by Sir Alex Ferguson’s Manchester United, something he promised to do when he took charge at Old Trafford; go without Champions League football, failing to qualify for the 2010/11 edition, and witnessed a power struggle between George Gillett and Tom Hicks, resulting in unrest amongst the fans, before the club was eventually sold to Fenway Sports Group. Yet, even with King Kenny at the helm and John W. Henry’s ownership providing fewer talking points and more stability than the previous regime, there have still been a few obstacles for Liverpool to overcome. Some threatened to tarnish their reputation more than others. But, after the Luis Suarez affair that has provided a subplot to Liverpool’s entire season to date, the money invested in a promising transition under Dalglish – currently totalling at over £110m, and Andy Carroll finally appearing to settle in a year after his record breaking move, few would begrudge Liverpool’s Carling Cup final success. It had been six years since a trophy had been added to the cabinet; they’re still in the F.A. Cup, having knocked out Manchester United with Dirk Kuyt succeeding in being the hero that day, and European football next season is guaranteed, having missed out altogether this campaign. But in the long run, what does it mean for The Reds: is it stage one of Liverpool’s rebuilding process or just a minor triumph? It would be feeble to say Liverpool were lucky to have such favourable circumstances present to win the Carling Cup and it would do Cardiff an injustice, in what was an admirable performance orchestrated typically by Malky Mackay, to do so. To get to the final, Liverpool had to overcome three lots of Premier League opposition, having beaten Exeter City and a resurgent Brighton & Hove Albion outfit: a Stoke City side at the formidable Britannia Stadium, before two of last season’s top four sides in Chelsea and Manchester City. They determined their own luck. Before the game, Liverpool captain Steven Gerrard stated that “[Liverpool fans] deserve a trophy,” whilst ex-Kop favourite Robbie Fowler issued a rallying cry to the current fan’s favourite, Luis Suarez: “I’d like to think that I repaid [the Liverpool fans] by doing the business (scoring in the League Cup final against Birmingham in 2001) for Liverpool on the pitch – and that’s what I’d love to see Luis doing for Kenny.” Whilst Luis Suarez didn’t grab a goal in the final, it was the first trophy that the new bought-in generation of Liverpool players have collected at Anfield. The purchases of Luis Suarez, Andy Carroll, Jordan Henderson, Stewart Downing, Charlie Adam, Jose Enrique and Sebastian Coates, all since Dalglish took over, have reaped their first trophy in their first full season together and calling it a minor triumph would discredit Cardiff, but as it is the League Cup, seen as secondary by most, I imagine some will do so. However, is it right to call it a minor triumph or is it indicative of the progress Liverpool are making? If this is all the current Liverpool team achieve, then yes it is a minor triumph: however, Kenny Dalglish has made a marked improvement on the successes of Liverpool. When he took over from Roy Hodgson, a man whom he helped Liverpool to appoint, their league position was abysmal by their standards: they were 12th, below Everton, they’d conceded more than they’d scored, lost more than they’d won and after 20 games, they were already 19 points away from the top. Kenny came in and things dramatically changed: Liverpool were hoisted up to a 6th place finish, 22 points adrift of league champions Manchester United, meaning – bar their first game under Kenny – Liverpool matched the Champions point for point; Liverpool’s concession rate dropped by 33% and all the while, their goal-scoring exploits increased by more than half at an increase of 62%, from 24 goals in 20 games under Hodgson to 35 in 18 with Dalglish. Liverpool are on the up: a return to a top four finish, something which has alluded them since the 2008/09 campaign in which they finished second pushing Manchester United all the way finishing just four points adrift, looks out of the question this season. However, it was always going to be a tall order considering the number of new personnel in through the doors at Anfield and therefore the success of the League Cup, with the F.A. Cup still to play for, deems this season a success already, providing Liverpool go on to perform how they’ve done to date. The Cup win can only serve Liverpool well. Under other managers, Liverpool may have crumbled as the game progressed and Cardiff were still leading – although their cup successes in similar circumstances against Birmingham and West Ham show an undying trait of determination lives long in the veins of Liverpool. Yet the win will galvanise them and with an impressive defensive record in the league, with only Manchester City conceded fewer, Liverpool continue to go from strength to strength in the second coming of King Kenny and with a transition underway, success with delicate changes and altercations in playing staff is a credible effort. 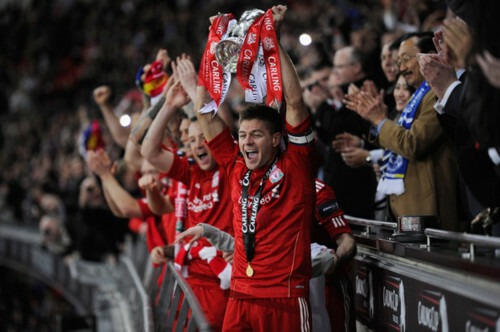 The Carling Cup final wasn’t just a minor victory – it’s a sign of things to come.